Barry Eison of Tennessee has grand plans for his hovercraft. And since he’s a ‘first things first’ person, Barry based his future plans on a strong foundation of training: “My biggest concern is being able to safely operate the craft.” So, naturally, his first step was to enroll in an HTC training course. 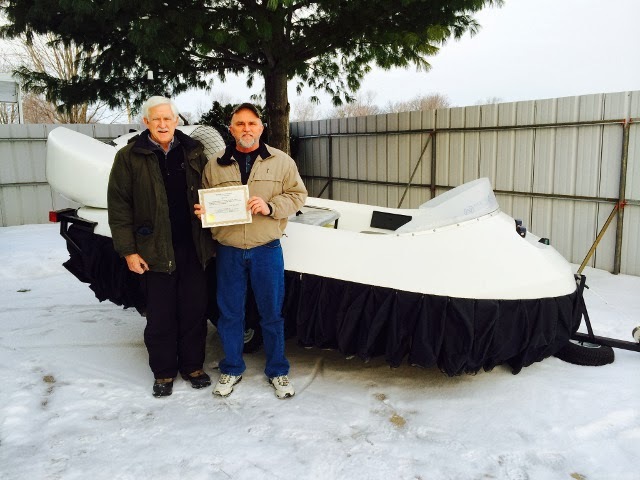 Barry Eison (right) accepts his Hovercraft Pilot Certification from HTC Senior Instructor Chris Fitzgerald. 1) Training is absolutely necessary. If you don’t know how to use it, stay off of it! 3) If one gets too “cocky” or arrogant in their familiarization with the craft, you can get hurt or damage the machine! 6) Think, think, think! Starting, stopping - every move requires thought until you know it by heart. 7) Do not overreact when responding to changes. 8) Learn the machine – inside and out, front to back. That’s because Barry Eison keeps first things first – and thoroughly understands how important it is to fly before you buy! Cold is cool when you have a hovercraft! Want to see for yourself why hovercraft are the vehicle of choice for ice fishing, ice rescues and other ice operations? Schedule an HTC Test Flight before the Spring thaw! 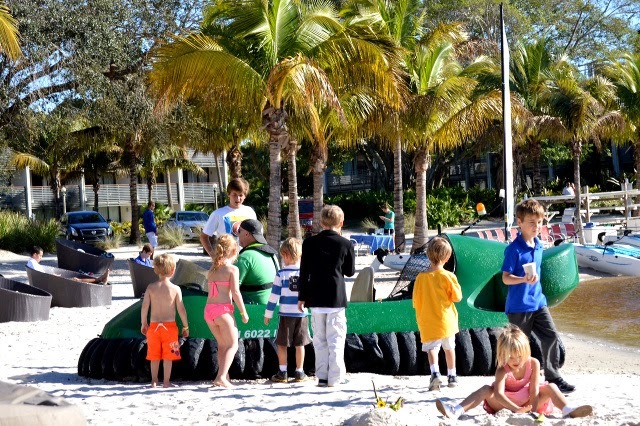 You'd think there was nothing else on a beach for kids to do! Oh, yeah! 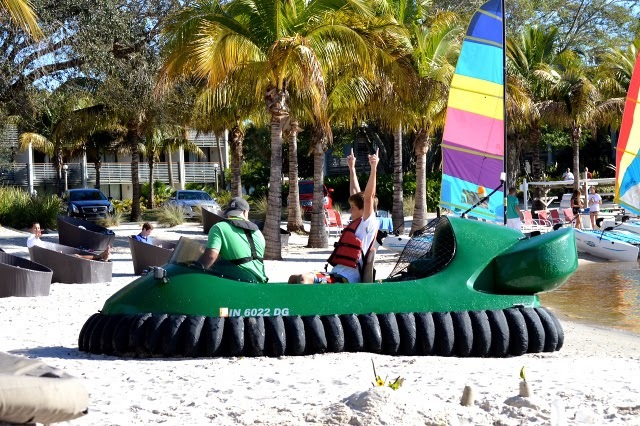 There's nothing better than a hovercraft ride! From being an event highlight, to increasing charitable donations, to boosting military recruiting – nothing does it better than a hovercraft! Did you think Bubba’s Hover was just a passing fad? If so, think again! 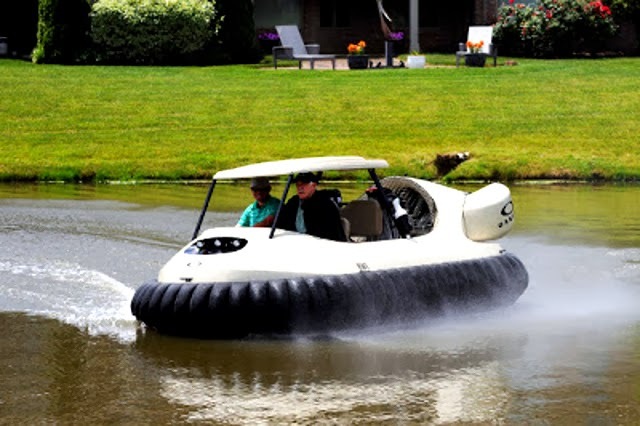 Since the world discovered that Neoteric’s Hovercraft Golf Cart is an attention-getter, it has definitely been going places - events throughout the world are featuring it as a major attraction. This weekend, HTC’s Flight Instructor Steve Stafford will join Wall Street executives, investors, and world business leaders at Club Med in Port St. Lucie, Florida for “the ultimate adventure in capitalism”: the Noble Financial Capital Markets 10th Annual Equity Conference. While Cadillac provides general transportation at this famed event (last year it was Porsche), Steve will really have them flying high with rides in the HoverGolf Cart. The 550 attendees will enjoy every luxury and leisure activity imaginable – from sailing, paddle boarding and flying trapeze lessons, to tennis with world-famous coach Gabriel Jaramillo and golf with the Club Med Academy and its renowned teaching pros. And, of course, gliding over the greens and hazards with an HTC pro in the most famous golf cart in the world! No doubt about it, with HTC and the Neoteric HoverGolf Cart on board! Check back next week to see event photos! Watch tomorrow! HTC hovercraft on Discovery Channel/Velocity TV Tech Toys 360! This will show you why HTC trains on Neoteric hovercraft! Discovery Channel/Velocity TV’s Tech Toys 360 travels the world to find the most innovative vehicles and let you meet the people behind them. So of course they found the Neoteric Hovercraft and Bubba’s Hover!